Fans of “Jimmy Kimmel Live” are in for a very special episode Tuesday evening. As detailed in an announcement on the Jimmy Kimmel Live Facebook page, a power outage shut down filming of the show an hour before taping. With guests and a studio audience waiting, Jimmy Kimmel rose to the challenge, recording the entire show using only his MacBook’s iSight Webcam. 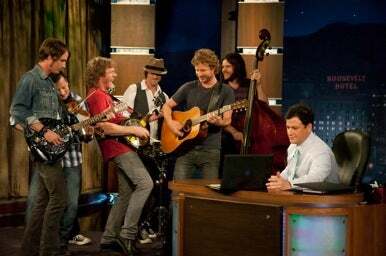 Airing at 12:05AM eastern time (which, technically, would make Wednesday), the episode will feature all-Webcam interviews with guests Seth Rogen, John Henson, and country star Dierks Bentley, who improvised an acoustic performance for the occasion. The Jimmy Kimmel Live Facebook page has posted a handful of photos documenting the unconventional shoot. The reaction by the show’s many Facebook fans has been overwhelmingly positive so far, with more than 95 “likes” on the post, and a number of encouraging comments. Regardless of whether Kimmel pulls off a successful show with his trusty MacBook, Tuesday’s episode should make for some interesting viewing indeed.